I have created these for years for my clients and am now offering them in my shop! 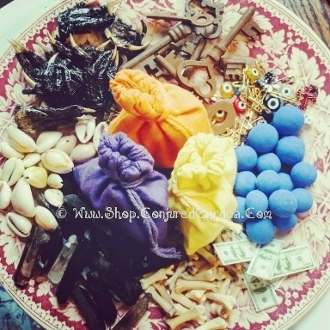 Each Mojo is created with ingredients such as seeds, nuts, herbs, roots, flowers, beans, coins, charms, stones, metals, beads, feathers, dirt, bones, sticks, salts, curios, sea shells, teeth, wax, nails, resins, hair, claws, sigils/veves or pictures among many other natural curios and ingredients. The ingredients will suit the purpose you specify. It will be packed full, charged, and ready to work! The word "mojo", is a version of the word "mojuba" from West Africa, meaning "to give praise". Mojo's are created from ashe', the natural, invisible power of our mother, the earth. any natural objects such as bones, feathers, earth, stones, roots, etc., contain ashe' By utilizing and acknowledging these charms you are giving praise to the earth, our mother, and praise to you deity or saint. I can make a mojo for almost any deity or saint, so just let me know which one or what your situation is and we'll come up with the best deity/saint to suit your needs! Each mojo will be different as these are personalized magickal items.